Is a novel that tells story of a prince[?] who has returned from Switzerland where he was being treated for epilepsy[idiocy?] who knows? Dostoevsky doesn’t say. He has been there four years and now returns to mother Russia to follow up on a letter he has received detailing his inheritance from one of his late benefactors. Dostoevsky tells us the story of the Epanchin’s lovely girls, their relationship with their eccentric mother, their gentleman father and their many suitors. Nastasia Philipovna is a strange but beautiful girl. It is hard to determine whether she is insane or just difficult, but a great character all the same. Rogojin who is in love with Nastasia ends up killing her. Well, one can understand why. Twice, she run away from him just when they were about to wed. She decides to wed our idiot prince from whom he flees to the hands of Rogojin who we have said already kills her. There are minor characters like Lebeddef, Budorsky, Colia, Varavara, Varia, Adelaide, Alexandra, Prince S, Evgenie and others who contribute to the development of the plot. The prince is in love with two women, Nastasia and Aglaya. He agrees to wed Nastasia just after proposing to Aglaya in their house in the presence of family and a few members of society. The scandal rocks Pavlofs where they have been residing and the family decides to move away. […. ]‘It is not a Christian religion, in the first place,’ [..] ‘And in the second place, Roman Catholicism is, in my opinion, worse than Atheism itself. Yes— that is my opinion. Atheism only preaches a negation, but Romanism goes further; it preaches a disfigured, distorted Christ—it preaches Anti-Christ—I assure you, I swear it! This is my own personal conviction, and it has long distressed me. The Roman Catholic believes that the Church on earth cannot stand without universal temporal Power. He cries ‘non possumus!’ In my opinion the Roman Catholic religion is not a faith at all, but simply a continuation of the Roman Empire, and everything is subordinated to this idea—beginning with faith. The Pope has seized territories and an earthly throne, and has held them with the sword. And so the thing has gone on, only that to the sword they have added lying, intrigue, deceit, fanaticism, superstition, swindling;—they have played fast and loose with the most sacred and sincere feelings of men;—they have exchanged everything—everything for money, for base earthly POWER! And is this not the teaching of Anti-Christ? How could the upshot of all this be other than Atheism? Atheism is the child of Roman Catholicism—it proceeded from these Romans themselves, though perhaps they would not believe it. It grew and fattened on hatred of its parents; it is the progeny of their lies and spiritual feebleness. As the curtain closes on this novel, the prince is back in Switzerland for treatment, Adelaide’s wedding has been postponed, Rogojin is in prison for murder, Hippolyte is dead. Note: There are those who have written elsewhere that the Idiot as compared to The Brothers Karamozov is a better novel. I disagree with them. The Brothers Karamazov covers the themes of morality, religion, love in much more detail as compared to the Idiot. Both novels however are all well written. Men who irrationally assent to anything, resemble those who are delighted with jugglers and enchanters. For as most of these are depraved characters, who deceive the vulgar, and persuade them to assent to whatever they please, this also takes place with the Christians. Some of these are not willing either to give or receive a reason for what they believe; but are accustomed to say Do not investigate, but believe, your faith will save you. For the wisdom of the world is bad, but folly is good. Your genial host will be away on holiday beginning tomorrow till 6th of January 2014. In this time we don’t promise we will be able to write any posts, respond to your comments or visit your very lovely blogs. We hope however that you shall still find something worth reading on this blog that you may have overlooked or that for some given reason you have a new interest in. That is the good news. We take this opportunity to sincerely thank you, one and all for your continued friendship, visits, comments and likes and most of all for the insights you have shared. If you have felt slighted, we apologize. If you felt your questions were not answered, ask them again, we promise to look at them when time allows. As a bonus, here is a photo of Jean- Pierre Hallet whose story has been the subject of this post. 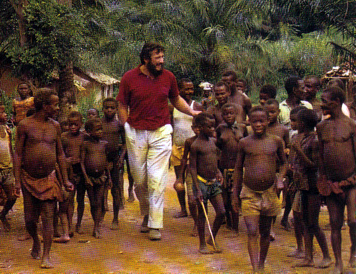 My great friend and teacher shared with me a story about the Efe people taken from The Pygmy Kitabu by JEAN-PIERRE HALLET and ALEX PELLE [yours truly is yet to read the book but I will relay the story nonetheless. “They argued and argued. Finally, he gave in. His heart pounded with fear as he sneaked into the deep, deep forest. Closer and closer he came. There it was — the forbidden tree of God. The sinner picked a tahu fruit. He peeled the tahu fruit. He hid the peel under a pile of leaves. Then he returned to camp and gave the fruit to his wife. She tasted it. She urged her husband to taste it. He did. All of the other Pygmies had a bite. Everyone ate the forbidden fruit, and everyone thought that God would never find out. I think you will like this interview, I did like it. For those of you who have those entertainment boxes connected to some cable, you must have heard that we have been celebrating 50 years since [in]dependence. The top honchos or clowns as I prefer to call them decided that one day wasn’t enough so gave us Friday off too which I must say was a good thing- I left my bed at 1200 noon :-P.
As a great cynic, I don’t see any reason for celebration and I will tell you why in a second. 50 years later, close to 60% of the population have no access to clean water and proper sanitation and this demographic includes those living in the city slums. What is there to celebrate? 50 years after the British left, we have not added a single unit length to the railway. On the contrary, those who were managing it have left it disuse, it’s land grabbed, train service to most parts discontinued. What is this we are celebrating? When the founding fathers of the nation, such men as Jaramogi, Ramogi Acheing’ Oneko, Kaggia, Ngei fought for independence, they imagined a just society. What happened later is a far cry from their ambitions. We still have Kenyans who are called squatters in their own country while a few families sit on acres of land they don’t know what to do with. What independence is this? They were better of in settlement schemes run by the white overlords! Most parts of the country are unreachable because of poor roads, roads which donor agencies funded but appears to me to have been built in people’s bellies for we see them nowhere. I must add here that the last regime made an attempt to improve this situation. At least a number of roads are being carpeted and missing links being upgraded. Maybe this is what they are celebrating, I don’t know. A big population do not have access to proper medical facilities and if there is a medical facility, then there is insufficient staff to attend to the big population. What is there to celebrate? 50 years down the line, the country is divided along tribal lines so severe that in most government offices, one feels like he interupted a village baraza being addressed by the village headman for the lingo is local dialects. How is this anything to celebrate when we can’t live in harmony with one another? A country that has relatively large tracts of arable land is so food insecure that any major drought in some parts of the country always results in Kenyans for Kenyans initiatives. How do we celebrate such poor governance? Public transport in our major cities is for lack of a better word non existent. It is a mess run mostly by thieves and would be thieves. It is unreliable, inefficient and most times the crew have little respect for passengers if they have any. How do we celebrate such lack of progress? Insecurity, especially with proliferation of small arms is on the increase. One is never sure where the robber is. At any place you are a candidate for muggers or armed robbery while parliament and treasury in every consecutive budget allocates millions of money to the defense department and office of the president. How, dear friends, is this something to celebrate? After several years of struggle for media freedom, we have the vice president saying media freedom is alien to Africa and is being promoted by the west for selfish reasons and the top clown says in Britain the fines that are attached to media laws are higher and prohibitive than what the current parliament has passed. What madness is this? How can we as a people sit and celebrate such mediocrity, such lunacy, such madness without feeling some shame. Am appalled at the type of people who we elected as representatives. 7 or so years ago, we fought because a few stupid clowns we paid to conduct elections bungled it so badly that the then chairman in a later interview declared he doesn’t know who won the elections yet he declared some clown as the winner, a clown who was immediately sworn in as president in moonlight like the rest of the country wasn’t to know. Now we still have internally displaced persons waiting to be resettled by the government. Tell me, what are they to celebrate? For those Kenyans who think we have a lot to celebrate, please weigh in, I really would want to hear you out.